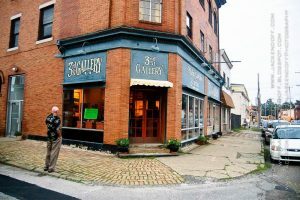 3rd Street Gallery is a fine art space dedicated to providing quality and original art through the promotion of local, national, and international artists. We host a variety of special events in our spacious restored gallery, including art exhibits, social events, and charitable gatherings. We provide a forum for artists, collectors, and the public to experience painting, works on paper, jewelry, and pottery. A project of the Pittsburgh Cultural Trust, and managed by the Trust’s Education and Community Engagement department, 707 Penn Gallery features exhibitions by local and regional artists working in multiple disciplines. 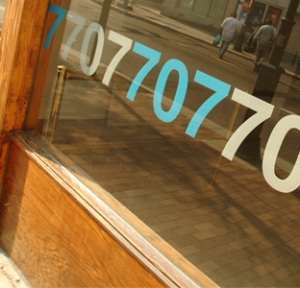 The gallery is located at 707 Penn Avenue near the intersection of Penn and Seventh Street. The Pittsburgh Cultural Trust is unique in the arts industry for its commitment to providing high-quality, contemporary visual and public art along with a robust performing arts schedule. The Trust owns and operates six galleries, offering arts exhibits that are free and open to the public. The Pittsburgh Cultural Trust has overseen one of Pittsburgh’s most historic transformations: turning a seedy red-light district into a magnet destination for arts lovers, residents, visitors, and business owners. Founded in 1984, The Pittsburgh Cultural Trust is a non-profit arts organization whose mission is the cultural and economic revitalization of a 14-block arts and entertainment/residential neighborhood called the Cultural District. The District is one of the country’s largest land masses “curated” by a single nonprofit arts organization. A major catalytic force in the city, The Pittsburgh Cultural Trust is a unique model of how public-private partnerships can reinvent a city with authenticity, innovation and creativity. Using the arts as an economic catalyst, The Pittsburgh Cultural Trust has holistically created a world-renowned Cultural District that is revitalizing the city, improving the regional economy and enhancing Pittsburgh’s quality of life. Thanks to the support of foundations, corporations, government agencies and thousands of private citizens, the Trust stands as a national model of urban redevelopment through the arts. ABANDONED PITTSBURGH is an ongoing project documenting these forgotten places where a strange, haunting beauty still exists. All photographs by Chuck Beard. Visit the gallery for prints, books, and Abandoned Pittsburgh themed gifts — including candles, coffee, soaps, and more! Ace Hotel Pittsburgh makes its home in a century-old former YMCA building at the heart of East Liberty. We’re surrounded by a community that, through grassroots support, has helped to create a place both by the neighborhood and for the neighborhood. We’re a short jaunt from some of the best restaurants in the city, museums and braintrusts, an active art and idea scene with shops, galleries and cafes filled with folks pushing and pulling culture, advocating at the edges of Pittsburgh’s future, helping one another grow through the deep roots of one of America’s most hope-springing cities. ​ We have public spaces to gather, start a startup, watch the game, divine plans large and small. There’s world-class dining and drink in the building, at the ready — and if you’re into sleeping, we happen to have the most comfortable beds in the galaxy. The Pittsburgh Cultural Trust’s Agnes R. Katz Plaza is arguably one of the city’s most recognizable and lovely sites. 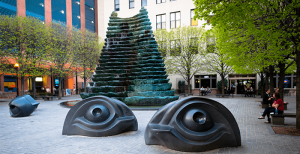 Drawing inspiration from Pittsburgh’s rising topography, the late, famed American artist and sculptor Louise Bourgeois created the 25-foot bronze fountain centerpiece of this 23,000 square foot public plaza. The sculpture is notable as the largest public art commission by Bourgeois. Agnes R. Katz Plaza was a creative collaboration between Bourgeois, landscape architect Daniel Urban Kiley, Theater Square’s architect Michael Graves and the Trust. Katz Plaza was named in loving memory of Agnes. R. Katz by her children. In addition to offering an urban oasis for the community, Agnes R. Katz Plaza is utilized by The Pittsburgh Cultural Trust for outdoor live performances including JazzLive, First Night, Festival of Lights and Gallery Crawl events. Auditorium that seats over 100, inside the Alloy 26 space, located in the NOVA Place building (the old Allegheny Mall). Arcade Comedy Theater is downtown Pittsburgh’s destination for all things comedy. 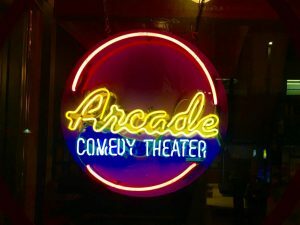 Opened in February 2013, Arcade is an intimate 75-seat space which hosts stand-up, improv, sketch comedy, variety acts, and more. 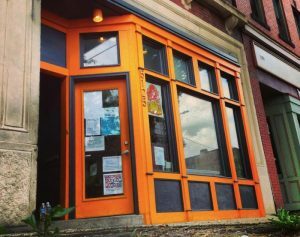 With affordable, weekly shows, engaging classes, and a variety of programming, the Arcade is dedicated to being a fun and accessible theater in Pittsburgh’s Cultural District. OUR MISSION: Arcade Comedy Theater provides an interactive platform for players of all levels, both onstage and off, to experience various forms of theatrical comedy, from proven standards to offbeat styles. OUR VISION: We strive to elevate and advance the art of comedy in Pittsburgh. 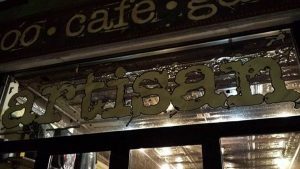 Artisan was started by Jason and Meliora Angst in 2011 when they bought an abandoned structure on Penn Ave that needed a whole lot of love. Over a period of two years, they built what is now Artisan. First it was a tattoo shop and art gallery, but Mel and Jason always dreamed of more. It was a big building; they wanted a coffee shop, maybe a store. They wanted Artisan to be a collective of artists and businesses, a space to bring people together in the community. Tyler Bryan has finally opened the Artisan Cafe, the coffee shop is on our 1st floor. We have a seating area open with wifi for you to just sit back drink amazing coffee and relax. Mel has been slowly adding inventory to the retail section of the gallery, Artisan Bazaar. The Bazaar has a collection of handmade clothing, lingerie, accessories, patches and prints and small artworks from artists that have shown in the gallery as well as small independent makers from all over the world. Artists Image Resource (AIR) provides community access to facilities and printing equipment through its community access programs. Access is scheduled based on experience. 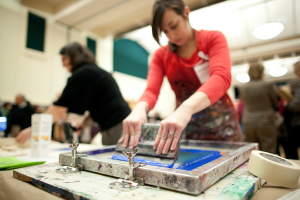 Processes include screen printing, digital printing, intaglio, lithography, and letterpress. AIR provides technical support in any process billed out on an hourly basis. Community access programs fall into three categories (open studio, tutorial, and shop rental) and all shop activities are scheduled via email info@artistsimageresource.org. Pricing schedules can be made available upon request. WHO CAN USE OPEN STUDIOS If you are an experienced screen printer and you need a place to makes films, burn screens and complete a run of posters, t-shirts or prints, you can access the AIR open studio on Tuesday and Thursday evenings from 6 – 10 p.m. Other print processes available for a shop fee including orientation. WHAT ARE OPEN STUDIOS The Open Studio program is a first-come first-served, volunteer-driven environment designed to allow knowledgeable printers to print short run projects that can be completed in one evening. HOW CAN YOU PARTICIPATE? Present your project to the volunteer attendant. Depending upon how busy the shop is, the attendant can assist you in making the film and exposing the screen. The attendant will further provide the, supplies package and set you up to print. Any assistance beyond this is billed at $25 per hour. PLEASE NOTE AIR’s open studio is not conducive to larger projects, but other shop space and equipment can be made available. If you need instruction, tutorials can be scheduled. If you need more controlled space, shop rentals are available. Short orientations can be provided on the spot during open studio for $20, based on availability. EQUIPMENT AND MATERIALS Film positives at 8 x 10 inches for $1 and at 11 x 17 inches are $3 each. Larger films are available at $5 per sq. foot. 20 x 24 inch screens with a 200 mesh count are available for $5 each. Shop screens are coated with a direct photo emulsion, exposure included. 23 x 31 inch screens with a 200 mesh count are available for $10 each. Larger screens are available upon request (please allow for two days lead time). Supplies package: Printing stations (hinged screen lock downs), squeegees, ink scoops, masking tape, paper towels, registration punch and pins, and some proofing paper is made available as part of a $5 supplies package. Acrylic inks are available (for paper and fabric) in various colors $18 for quarts and $7 for eight ounce containers. Some papers are available on site ranging from 25¢ to $10. Send inquiry to info@artistsimageresource.org. Assemble is a 501(c)3 nonprofit located in Garfield, a neighborhood in Pittsburgh’s East End. We are dedicated to providing an on-ramp to Science, Technology, Engineering, Arts, and Mathematics (STEAM) in the community. We offer daily educational programs to youth throughout Pittsburgh, both in our 4824 Penn Avenue space and at local schools and community centers. Our programs provide a platform for experiential learning, open creative processes, and building confidence through making. We envision diverse neighborhoods of empowered people who create, connect, learn, and transform together. We build confidence through making by uniting communities of artists, technologists, makers, and learners. 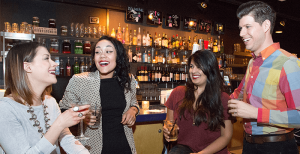 The Backstage Bar at Theater Square is a favorite Cultural District hotspot for drinks, a quick bite to eat, live entertainment, and great company through the evening. It’s the perfect place to meet before a performance, or lounge after a show, or just a great gathering place with friends and colleagues. The Backstage Bar serves an outstanding list of premium wines, spirits, specialty drinks and beers to complement the fun and casual food menu and often features live entertainment with no cover charge. We are open before and after shows. Or, stop by after work for Happy Hour (9–11 pm Tuesdays – Fridays). Often called a hidden treasure, you can enter the bar from behind the fountain in Katz Plaza, or through the main entrance to the Cabaret at Theater Square, under the Theater Square marquee. Outdoor Dining Weather permitting, The Backstage Bar offers al fresco dining along-side the soothing Katz Plaza fountain and the breezy Linden trees. If you haven’t visited The Backstage Bar, summer is the perfect time to discover this delightful outdoor setting. Menu Enjoy an eclectic mix of tapas, platters, entrées and desserts—which can be served quickly to meet curtain calls. View our Backstage Bar menu (PDF). Entertainment The Cultural District just got a little more interesting! Along with great food and drinks, the Backstage Bar often features entertainment before and after shows downtown. 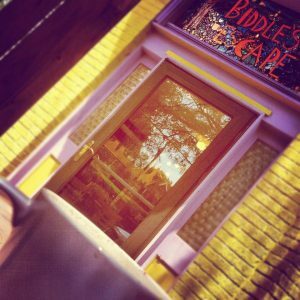 We invite you to stop in for live music (no cover charge) before or after a performance in the Cultural District. The Benedum Center for the Performing Arts, a Pittsburgh Cultural Trust theater, is a focal point of Pittsburgh’s Cultural District. 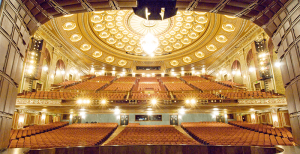 The 2,800-seat theater is home to Pittsburgh Cultural Trust presentations including PNC Broadway Across America, Pittsburgh Dance Council, CD Live, Pittsburgh International Children’s Theater, Cohen & Grigsby Trust Presents, and First Night Pittsburgh. The Trust also provides priority programming dates on the Benedum stage to Cultural District resident companies including Pittsburgh CLO, Pittsburgh Ballet Theatre, and the Pittsburgh Opera. The venue is also available on a rental basis to promoters and community groups. Coffee shop and art space that hosts art events and workshops. Menu boasts hundreds of teas and coffees from around the globe. Visit our website to see a list of art events. 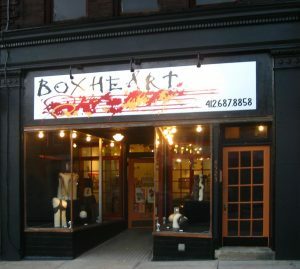 Located in Bloomfield, Pittsburgh’s “Little Italy,” BoxHeart exhibits emerging and mid-career artists whose artwork exemplifies the diversity and originality of contemporary art and fine craft. BoxHeart’s exhibition schedule supports our regional, national, and international gallery artists as well as our mission to discover new talent that exists around the world. Providing an outlet for conceptually engaged and aesthetically resolved exhibitions that both reflect contemporary art issues and are relevant to the community, the heart of our business strives to uncover emotional connectivity by identifying and promoting artists that advocate for socio-emotional and socio-cultural equality through the artwork they produce. 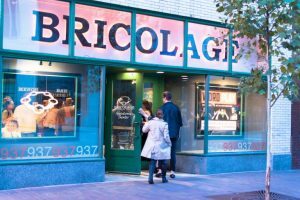 brillobox uses its second floor as a cultural space that is committed to providing the pittsburgh community with the highest quality entertainment and social experiences. 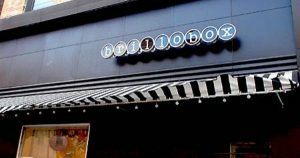 brillobox also provides the room for alternative events such as dj dance parties, art events, spoken word, fundraisers, variety shows, screenings, and any other community-oriented activity. for any booking request, please email brillobox at brilloboxevents@gmail.com. Located at 5106 Penn Avenue, BUNKERprojects is an experimental gallery and residency program designed to support emerging artists in a living laboratory. Inspired by art as social practice, BUNKER seeks to encourage the fluidity between art and life in the creative process. 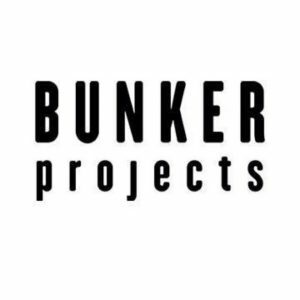 BUNKER offers individual and coupled artists three-month residencies in a custom-designed space. Two bedrooms, two studios, and two gallery rooms allow two resident artists to cohabitate and create individual or collaborative bodies of work to be shown on site. In addition to resident shows, BUNKER also provides exhibition space for outside artists and creative groups for gallery shows and special projects. Artists working in all disciplines are encouaged to apply. 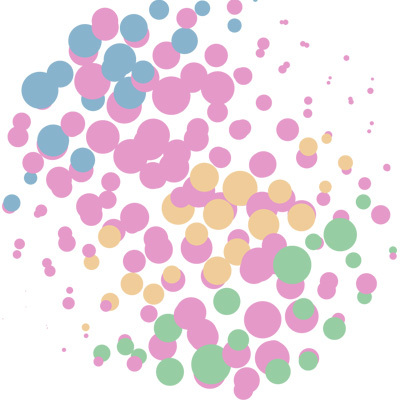 Multi-disciplinary, interactive, performative, and non-traditional mediums are all supported. Originally built in 1903 as the Gayety Theater, The Pittsburgh Cultural Trust purchased this 1300-seat venue, then called the Fulton Theater, in 1988. The Trust renovated and reopened the Fulton Theater in 1991. The theater was renamed the Byham Theater in 1995, in recognition of a gift from William C. and Carolyn M. Byham. 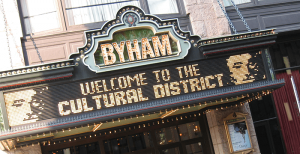 Today, the Byham Theater is home to a wide variety of performing arts, including dance, music, theater, film, and family-friendly events held throughout the year. Both the Carnegie Music Hall and Library Lecture Hall are located are 4400 Forbes Avenue in Oakland, and share the space building as the Carnegie Museums of Art and Natural History and the Carnegie Library Lecture Hall–Main. About the Museum Our Mission We create experiences that connect people to art, ideas, and one another. At CMOA, we believe creativity is a defining human characteristic to which everyone should have access. CMOA collects, preserves, and presents artworks from around the world to inspire, sustain, and provoke discussion, and to engage and reflect multiple audiences. 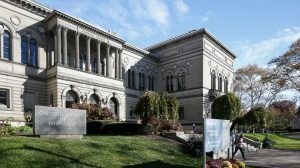 A Note From Our Directors Carnegie Museum of Art is arguably the first museum of contemporary art in the United States, collecting the “Old Masters of tomorrow” since the inception of the Carnegie International in 1896. 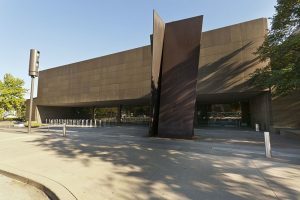 Today, the museum is one of the most dynamic major art institutions in America. Our collection of more than 30,000 objects features a broad spectrum of visual arts, including painting and sculpture; prints and drawings; photographs; architectural casts, renderings, and models; decorative arts and design; and film, video, and digital imagery. Through our programming, exhibitions, and publications, we frequently explore the role of art and artists in confronting key social issues of our time, combining and juxtaposing local and global perspectives. With our unique history and resources, we strive to become a leader in defining the role of art museums for the 21st century. Carnegie Museum of Natural History is a place of adventure, discovery and education that welcomes everyone to enjoy the wonders of its collections and exhibitions. 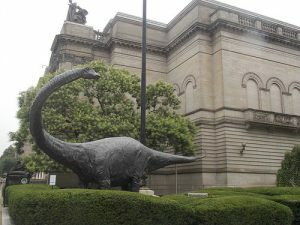 Founded in 1895 by Andrew Carnegie, the museum has maintained an international reputation for its ongoing research and discovery that create a better understanding of the history of the earth and its inhabitants. Today, the museum is ranked among the top five natural history museums in the country and features 20 exhibition halls including the blockbuster Dinosaurs in Their Time.